1 Lightly grease a nine by nine inch baking pan. 2 Set the oven temperature at three hundred degrees. 3 In a medium-sized bowl, whisk together the flour and baking powder, and set aside. 4 In a good-sized mixing bowl, beat the butter and sugar until they are well-combined. Add the brandy and continue to beat. Add the egg and beat just until incorporated into the batter. 5 By hand, add the dry ingredients and mix until the dough is smooth and the flour is all mixed in. 6 Measure one cup of the dough and set it aside. 7 Spread the remaining dough into the bottom of the pan. 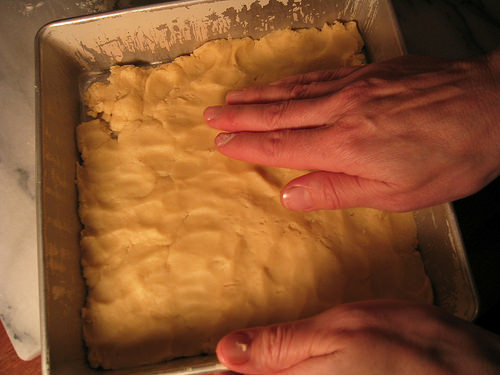 I do this gently with my fingers, patting them in a little flour if they begin to stick to the dough. 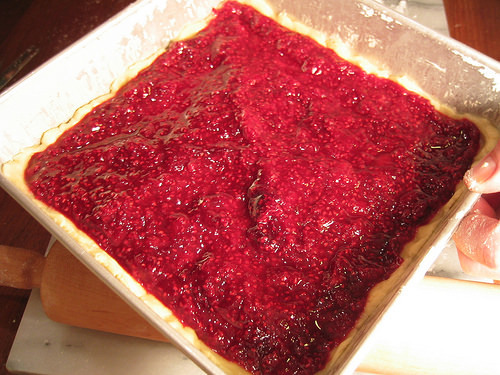 8 For the filling: put the preserves in a medium saucepan. 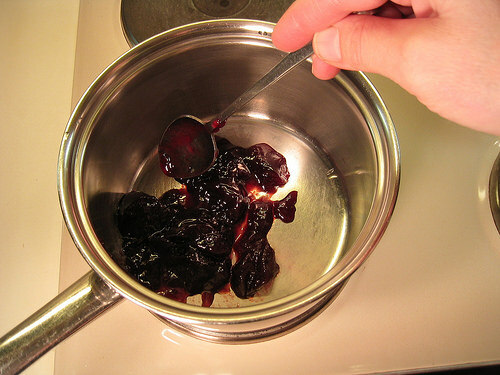 Over medium-low heat, bring the preserves to a gentle simmer. Let simmer about two minutes. Add the raspberries and let the sauce simmer, only mixing enough to keep the bottom from scorching. Let simmer a few minutes to release some of the moisture from the raspberries. The sauce should have a slightly syrupy consistency. 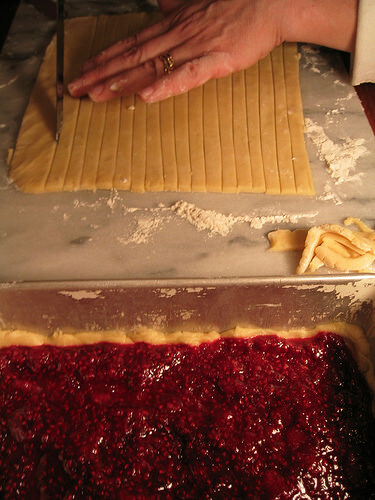 9 Spread the raspberry filling over the dough. 10 On a lightly floured surface, roll out the dough that has been set aside. Roll it to about the shape of the pan, a nine by nine-ish square. Cut strips about one-quarter-inch wide. 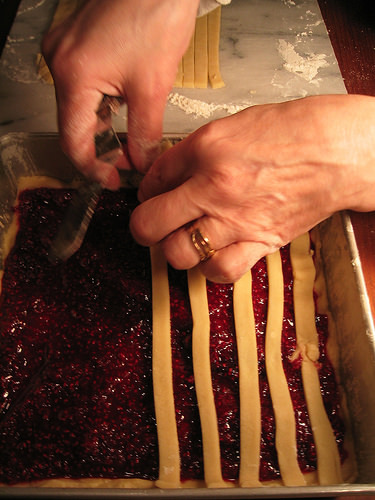 Lay the strips over the raspberry filling in a lattice design. I do not interweave the strips. They're quite tender. Don't be concerned if they break here and there. The baking will hide much of that. 11 Bake twenty-five minutes, or until golden on top. It may take a little longer. In this recipe, it's better if they're a little over-baked. They keep better and are easier to cut and remove from the pan. 12 Let cool completely on wire rack. 13 Mix together the confectioner's sugar and water. Drizzle this glaze as best you can on the lattice strips. However, I've never done this without a good bit getting on the fruit as well. And, truly, they look just lovely. 14 Cut them with a thin sharp knife and gently lift the squares out for serving. These keep quite well.